Each season presents slightly different circumstances that you might want to prepare for, especially when riding on longer or more remote trails. Since Fall riding season is right around the corner, I thought I’d list a few tips to help make your trail riding and camping experiences more safe and comfortable. The most obvious change as summer gives way to fall, is of course, the weather. Temperatures can vary greatly not only from day to day, but from morning to night. The day-time highs can still reach into the high 80’s, while the nights can cool down to below 60 degrees. Because of this, if you’re spending long hours in the saddle, the mornings can be chilly, the afternoons hot, and the evenings chilly again. When dressing for trail riding in these ever changing temperatures, it’s best to dress in layers so you can add or remove clothing as needed to keep you comfortable. Along with the temperature changes, rainfall amounts change too. After what is often a late summer drought here in Missouri, rain starts to fall more often again. Normally it’s never quite as much, and the storms are not usually as severe as in the spring, but it is still something to keep in mind when planning your ride. Always keep a rain slicker with you. Chilly morning rain could make for a very cold ride. Even if it rains during the hot part of the afternoon, you could find yourself uncomfortably cold if you haven’t dried out totally as the evening temperature drops. The season can also affect your horse, in a couple different ways. First, their attitude… A windy day can make a horse spooky. 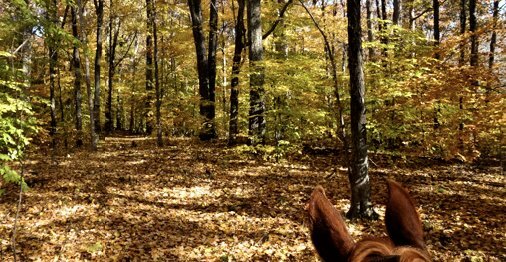 Wind mixed with blowing leaves and the crunching noise of leaves under foot can impair a horse’s hearing, which can make your horse to act like there’s ghosts in the woods. Second, temperature… Hopefully, over the spring and summer, your horse has had a chance to build up and be able to handle whatever amount of riding you might want to do. Be aware though, that if your horse isn’t in good condition, strained and overtired muscles can cramp up in the cooler morning temperatures. Warm your horse up with a bit of walking on flat terrain for a while, if possible, before making him negotiate more difficult hills and faster gaits. And make sure you cool them out after the ride, if they become sweaty, by letting them stand with a light blanket on or by walking them while they dry, if the temperature drops and it’s chilly. I still HATE getting the webs in my face. One of the great things about fall is the drop in insect population that you will start to notice. 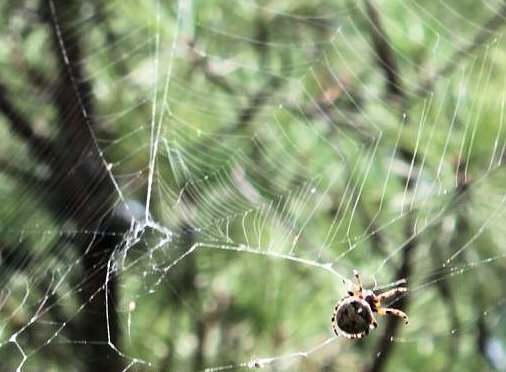 Less flies to bug you and your horse, and the spider webs across the trail will start to lessen. However, the chance of run-ins with yellow jackets increase as you get closer to winter. Most people I’ve talked to, and my own experiences with these nasty little bees, has been that they seem to be at their worst in September. Every incident I personally have had with them has been in September. I know they are active and you have a chance of having to deal with them in July, August, and October too, but by September, their nests are quite large, they seem to be getting quite mean tempered by then, and the temperatures at night haven’t started to get low enough to effect them yet. 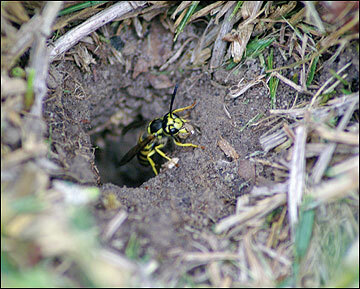 All of the Yellow Jackets I’ve encountered have been in ground nests on the trail. 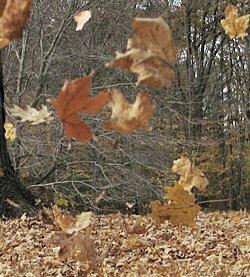 The changing leaves of the season can provide you with breath taking colorful vistas to enjoy, but as the leaves start to fall, you might find the trails a little harder to follow when the forest floor is covered with the dried brown leaves. What was once an obvious trail of dirt is now confusing because of the leaf coverage. If the trail is not well marked with signs on the trees, you might find yourself lost. That is why it’s very important to have a map and compass with you, and know how to use it. Even trails you ride a lot and think you know well can look like a trail you have never visited before without that little dirt track to guide you. 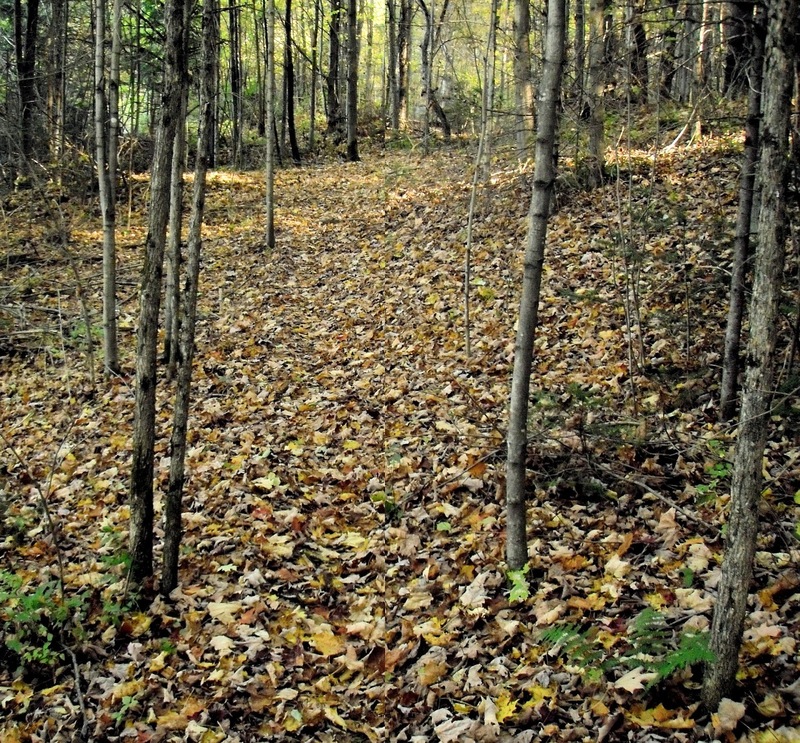 Other possible problems to be aware of is the fact that the leaves can cover and hide snakes, yellow jacket nests, holes, or uneven and unsafe footing on the trail. Of course, you also might find your horse to be more “spooky” because of the extra noise, especially if combined with a windy day. Lastly, fall ushers in the deer and turkey hunting seasons. Be sure you know which trails are closed for hunting, which ones provide a safer riding option because they do not allow hunting (like State & many County Parks), and which ones allow both hunting and riding at the same time. Even when riding at a trail that does not allow hunting, wearing hunter orange is a good idea in case the trail passes close to the edge of the park. Hunters on personal property that border the park still need to be able to see you. I personally do not ride anywhere that allows hunting during the open seasons, but if you do, please make sure you wear hunter orange, and consider not riding on opening day or on the weekends when the forest will be more populated with hunters. Also realize that most hunters will not find it humorous if you ride through and scare off the prey they are looking for, or if they almost shoot you, scaring both of you to death, so don’t be surprised if you end up in a confrontation with an irate hunter because you chose to ride during hunting season. It can happen. and either a rump rug or quarter sheet like this for safety if you ride during hunting season. 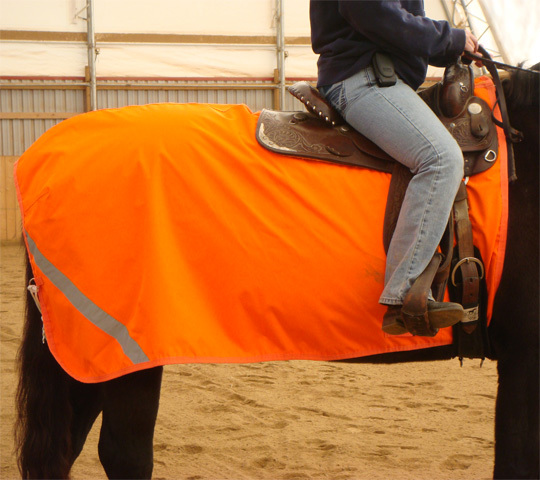 A bonus of wearing a hunter orange rump rug or quarter sheet like this is that’ll keep your horse’s muscles warm. Fall is my favorite season and I love riding this time of year. I hope these tips, which are meant more for the beginning trail rider, are helpful to all. I also hope everyone has a safe, fun, and happy fall riding season!